This festive coloring page features the word "Merry" surrounded by cheerful poinsettia leaves. colour in this merry page during the Christmas season! This coloring page featuring Santa delivering presents on Christmas Eve will surely put him in the holiday spirit! The holidays are a time to be creative! colour your own Christmas party invitations with this easy printable. This fun printable lets your child play Christmas tic-tac-toe; the classic game with a holiday twist. 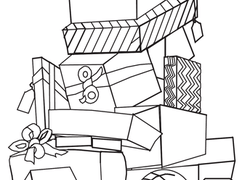 This detailed coloring page features a teetering tower of gift-wrapped presents. This "We Three Kings" printable makes a pretty Christmas decoration! This print features lyrics from the Christmas carol over a starry holiday background. This great coloring page keeps the kids entertained and creative. With colored pencils and card stock paper it's an easy homemade Christmas card to make. 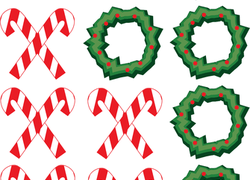 Challenge your second grader's knowledge of addition and subtraction with these festive Christmas word problems! Help your little one review maths facts with a fun coloring activity. She'll solve and then colour the addition and subtraction problems in each Christmas gift. Ho ho ho! Santa left some colorful presents filled with simple subtraction problems for your second grader to solve. These Christmas word problems will get your child doing maths as he thinks about presents under the tree. Try these word problems with your child. Make sure your kid makes the most out of his Christmas vacation by giving him this fun to-do list. You can introduce your child to the Christmas story with this angel Gabriel coloring page.